Temporal arteritis, also known as giant cell arteritis, is an inflammatory vasculopathy affecting medium- and large-sized arteries. While the superficial temporal branch of the carotid artery is particularly susceptible, arteries at any site can be affected. Temporal arteritis is defined by a granulomatous panarteritis with mononuclear cell infiltrates and giant cell formation within the vessel wall. This unique histologic characteristic confirms the diagnosis of temporal arteritis in biopsy specimens of the temporal artery (TA). This article provides a method for consistent, safe, and cosmetically sensitive biopsy of the superficial temporal artery (Current Procedure Terminology [CPT] code 37609). The relevant anatomy, indications, and contraindications for this procedure are also reviewed. The video below includes an introduction to the procedure. Introduction by Dr. Andrew Winkler. The superficial temporal artery is the smaller of 2 terminal branches of the external carotid. It begins behind the mandibular ramus in the substance of the parotid gland and courses superiorly over the posterior aspect of the zygoma. It can be consistently palpated in this region just anterior to the tragus. Approximately 5 cm above the zygoma, it divides into a frontal and parietal branch. As it crosses the zygomatic process, it is covered by the auricularis anterior muscle, which can aid in identifying the vessel. The superficial temporal artery runs within the superficial temporal fascia, also known as the temporoparietal fascia. This is also the fascia within which the temporal branch of the facial nerve traverses. As the vessel travels superiorly, it is crossed at the level of the lobule by the temporal and zygomatic branches of the facial nerve, which are traveling medially. Safe dissection within the substance of the temporoparietal fascia is permitted because of the divergent course of the vessel from the facial nerve. While the superficial temporal artery crosses the posterior zygoma and continues posteriorly, the temporal branch of the facial nerve crosses the zygoma in the middle third and courses anteriorly to innervate the frontalis muscle. Throughout its course, the artery is accompanied by the auriculotemporal nerve, which lies immediately posterior to it, as well as the superficial temporal vein, which lies anterior to the artery. The superficial temporal artery may be safely ligated because of anastomoses with the supraorbital artery of the internal carotid artery, among others. The video below demonstrates relevant anatomy. Anatomy of the superficial temporal artery. Temporal artery biopsy can be performed in a minor procedure suite or in the operating room, with or without the aid of an anesthesiologist. Most clinicians agree that the procedure can be safely performed with local anesthesia alone. If a patient is unable to tolerate the procedure with only local anesthesia, IV sedation with the help of a trained anesthesia provider may be necessary. The author's preferred method of anesthesia for temporal artery biopsy is using only local anesthesia. A 1:1 mixture of lidocaine 1% with 1:200,000 epinephrine and bupivacaine 0.5% with 1:200,000 epinephrine buffered with 8.4 % sodium bicarbonate provides good short-term and long-term anesthesia. To ensure that the entire area is anesthetized, perform a ring block with a 3-cm radius from the incision site. The ring block should be performed after marking the incision and the path of the superficial temporal artery, as epinephrine will cause arterial spasm. For more information, see Local Anesthetic Agents, Infiltrative Administration. A useful adjunct is to apply a topical anesthetic cream 20 minutes prior to injecting lidocaine. Though certainly not necessary, topical anesthesia can make the experience more comfortable for the anxious patient. The patient need not be marked prior to applying topical anesthesia. For more information, see Anesthesia, Topical. The video below demonstrates the local anesthesia for this procedure. Temporal artery biopsy should be performed in a minor procedure or operating room. Adequate lighting is essential, and overhead surgical lights are recommended. The patient should be placed in a supine position with a pillow under his or her knees and the head of the bed elevated 45 degrees. This position is relatively comfortable and prevents venous congestion in the operative field, which can complicate the surgery. The patient is asked to look away from the affected side so that the operative field is facing the surgeon. This and every surgical procedure begins with a frank discussion with the patient regarding the steps of the procedure, the risks, and the potential benefits. After consent is obtained, the patient is positioned as described above. If desired, apply 4% liposomal lidocaine to the temporal area and allow 15-20 minutes for it to take effect. This should ideally be completed prior to marking the patient, because markings can be removed when the topical cream is wiped off. The surgeon or a properly trained nurse/assistant marks the course of the superficial temporal artery by palpating the pulse. If necessary, a pencil-type Doppler ultrasound with water-based lubrication may be used. In general, the superficial temporal artery is palpable just anterior to the tragus. However, a highly affected vessel may be pulseless and thickened because of diffuse inflammation. In these cases, a hard, ropelike vessel may be palpable in the area of the superficial temporal artery. When the inflammatory process is extensive, flow through the artery can be greatly diminished. If neither a pulse nor cordlike vessel can be palpated, intraoperative Doppler ultrasonography will help to locate the vessel. Markings should begin just anterior to the tragus and continue well into the hairline. Mark out the surgical incision vertically within the temporal hair and greater than 3 cm from the temporal hairline. After marking is performed, a 3-cm radius ring block around the planned incision is performed using the 1:1 lidocaine/bupivacaine mixture. Shave the hair in an area 2 cm around the incision. Next, prepare the skin using an antiseptic solution. The authors prefer benzalkonium chloride because it is safe in and around the eyes, but any skin preparation solution will do. Drape the area with sterile towels in a manner that avoids completely covering the patient's eyes and face, as this can cause claustrophobia. Make the incision with a No. 15 blade scalpel directly over the artery, penetrating only skin and subcutaneous tissue to avoid injuring the underlying vessel. The blade should be beveled in the plane of the temporal hair shafts to avoid transecting the bulbs, which results in incisional alopecia. Also, avoid cautery of bleeding skin vessels if possible. See video below. Bluntly dissect through the subcutaneous fat and into the temporoparietal fascia. The vessel is found within the temporoparietal fascia. See video below. Carry out blunt dissection with a hemostat, spreading parallel to the vessel to avoid tearing it during exposure. See video below. Dissection of superficial temporal artery. Maintain hemostasis with electrocautery throughout the dissection to minimize the chance of hematoma formation. Once identified, carefully dissect the surrounding connective tissue to expose 3-5 cm of the vessel. Clamp the vessel with hemostats proximally and distally and use 3-0 silk ties to ligate the vessel. See video below. Harvest of the superficial temporal artery. Cut the intervening segment of artery using the No. 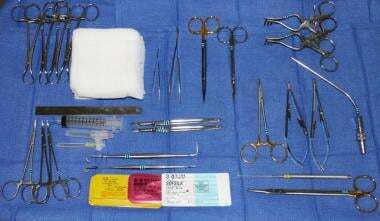 15 blade scalpel and send it to pathology in formalin. After adequate hemostasis is ensured, close the subcutaneous tissue using 5-0 interrupted Monocryl suture on a RB-1 needle, leaving the knot buried deeply. See video below. Closure of the deep tissues. Close the scalp skin with a running, locking 5-0 Vicryl Rapide suture. See video below. Skin closure and postoperative appearance. Dress the wound with ointment (eg, Aquaphor, white petrolatum). This should be continued 3 times daily until the sutures dissolve. Antibiotic ointment is not necessary. If hematoma formation is a concern, a pressure dressing of 4 X 4 gauze and Kerlix may be placed around the head. This is typically removed the following day. Know the anatomic layers of the scalp and the course of the facial nerve. Map out the course of the superficial temporal artery with the use of Doppler ultrasonography. Avoid injecting epinephrine near the artery, as this can lead to spasm. Obtain at least a 3-cm segment of artery to aid in diagnosis. Provide a relaxing environment in the procedure room and administer adequate local anesthesia. To avoid incisional alopecia, bevel the scalp incision parallel to the plane of the hair shafts and avoid electrocautery of bleeding skin vessels, if possible. When performed by a trained physician, temporal artery biopsy is a safe procedure. The serious risks of biopsy include injury to the branches of the auriculotemporal or facial nerve,  bleeding, wound infection, and hematoma formation. The more common minor complications include incisional alopecia, widening of the scar, and foreign body reaction to entrapped hairs. Another common occurrence is a nondiagnostic pathologic result, which can generally be avoided if the segment of artery removed is large enough. What is temporal artery biopsy and how is it used? What is the anatomy of the superficial temporal artery relevant to temporal artery biopsy? When is temporal artery biopsy indicated? What are contraindications for temporal artery biopsy? What is the role of anesthesia in the performance of temporal artery biopsy? Which equipment is needed to perform a temporal artery biopsy? Which equipment is needed for suture and dressing following performance of temporal artery biopsy? How is the patient positioned for temporal artery biopsy? How is the patient prepped for a temporal artery biopsy? How is a temporal artery biopsy performed? How is a temporal artery biopsy incision closed and dressed? What are pearls for the performance of temporal artery biopsy? What are the possible complications of temporal artery biopsy? McDonnell PJ, Moore GW, Miller NR, Hutchins GM, Green WR. Temporal arteritis. A clinicopathologic study. Ophthalmology. 1986 Apr. 93(4):518-30. [Medline]. Hunder GG, Bloch DA, Michel BA, et al. The American College of Rheumatology 1990 criteria for the classification of giant cell arteritis. Arthritis Rheum. 1990 Aug. 33(8):1122-8. [Medline]. Grossman C, Barshack I, Bornstein G, Ben-Zvi I. Is temporal artery biopsy essential in all cases of suspected giant cell arteritis?. Clin Exp Rheumatol. 2015 Mar-Apr. 33 (2 Suppl 89):S-84-9. [Medline]. Narvaez J, Bernad B, Roig-Vilaseca D, et al. Influence of previous corticosteroid therapy on temporal artery biopsy yield in giant cell arteritis. Semin Arthritis Rheum. 2007 Aug. 37(1):13-9. [Medline]. Ball J, Malhotra R. Efficacy of unilateral versus bilateral temporal artery biopsies for the diagnosis of giant cell arteritis. Am J Ophthalmol. 2000 Apr. 129(4):559-60. [Medline]. Gunawardene AR, Chant H. Facial nerve injury during temporal artery biopsy. Ann R Coll Surg Engl. 2014 May. 96 (4):257-60. [Medline]. [Full Text]. Kaptanis S, Perera JK, Halkias C, Caton N, Alarcon L, Vig S. Temporal artery biopsy size does not matter. Vascular. 2013 Dec 17. [Medline].